What you can do in an hour? If you can ride more than 49.7km then you can take cycling’s Hour Record. It has been the sport’s blue riband but has fallen from grace, although as you’ll see below, it’s often been forgotten only to get revived. There’s now renewed interest but the rules demand a retro-style bike. Can it find a new life or does it belong to the past? That’s the chart of the record over time each succesful attempt plotted. Note the x-axis and the clusters, a few attempts in the 1890s, the run in 1913-14 and then the 1930s, then nothing until the 1950s and so on. Perhaps we’re due for another cluster? The UCI adopted these rules to stop the record being seen as a victory for technology over the rider although we should note Graeme Obree had annoyed Hein Verbruggen too, you wonder if the rule restrictions involved a personal grudge. Whatever the UCI’s motivations I don’t agree with making The Hour into a track cycling version of the Eroica where bike technology is stopped in the 1970s. From its inception in 1893 the record was about speed, Henri Desgrange rode faster than any automobile could manage in the day. The record should be a contemporary contest and if a bike is UCI-legal for the 4,000m pursuit and other track-based time trials then why not let it be used for an hour? 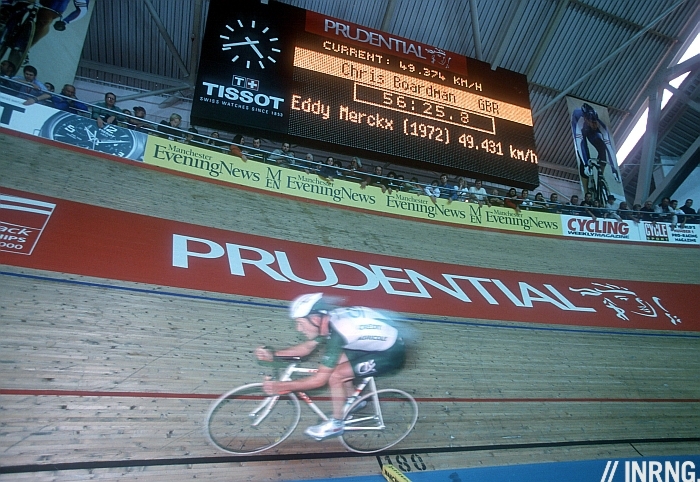 Chris Boardman saw his 56.375km record downgraded to mere “Best Hour Performance” and he took up the challenge for The Hour record in 2000, beating Eddy Merckx’s old distance by just 10 metres. Then in 2005 Ondřej Sosenka bagged the hour. A relatively unknown rider with two positive tests to his name, Sosenka’s reputation is not great. But even assuming he rode on bread and water alone, his status as second-tier time trial specialist diminishes a record usually held by the best rouleurs of each generation. This is where the likes of Fabian Cancellara comes in. All those rainbow jerseys, Olympic medals and classics trophies mean if he lends his name to a record attempt then The Hour will gain from Cancellara. Better still history suggests record attempts seem to cluster. When one rider takes the record then his peers will often follow, Tony Martin and Bradley Wiggins could be tempted. Technology has always played a part but the UCI’s restrictions on The Hour mean there’s little interest for bike manufacturers to showcase their wares. But if the UCI’s rulings restrict many technological there are still gains to be had. There have been notable improvements in clothing aerodynamics whether the fabric and fit of the skinsuit but the helmet too. These are small but every metre counts. This is a big undertaking and the more rider’s name is linked to a record attempt, the more dangerous it gets. Expectation builds. If tests and training don’t work out and the attempt is called off then the rider is beaten before turning a pedal. Similarly the longer the story goes on then the less surprising a record-breaking performance will be. This might not concern a rider or coach but The Hour is a media event and an abandoned attempt is likely to fall under the cover of competing schedules or post-classics campaign fatigue. Have our concentration spans got shorter? In the past the track was a way for the public to see a champion up close and for a promoter to make money on big ticket sales. But now the idea of watching a man cycling alone around a wooden track for an hour doesn’t seem guaranteed to pack in the crowds. It’s possible an attempt is done behind closed doors but as well as the crowd the cameras are going to be invited too. If it will be on TV then some creative production techniques will be needed. I’ve seen others talking about an hour long pursuit match but the rider has to be alone on the track, another rider creates a draft and is a pacing-aid so it will remain a solo event. On-screen graphics could depict a video-game shadow to show where the record schedule is but even watching this for an hour is slow. Podcasters The Velocast and other bloggers have imagined a simulcast event with Tony Martin, Bradley Wiggins and Fabien Cancellara all starting at the very same moment. Easier said than done, it assumes all three want to attempt the record and then they’d pick the same slot on the calendar despite different ambitions on the road and that they can each find a suitable track when they might all prefer the same velodrome. And that’s before we find a promoter capable of squaring off the money, booking and TV deals. It’s lost its shine but renewed interest could raise the profile of The Hour. Indeed talk of a record attempt could help The Hour as a concept more than any rider because they’re undertaking a risky bet. If they win, they could renew public interest in the record and if they fail then also make The Hour look special, an unreachable threshold that sits beyond any rainbow jersey. However it’s not certain if The Hour’s prestige can be revived. It might not work on TV and today most people associate riders from Eddy Merckx to Tony Rominger to Chris Boardman with other things than The Hour. Once a pure test of speed, today it remains a huge physical undertaking but the fixed rules make it look like a vintage bicycle competition. Thank you for an interesting article. May I just mention Michael Hutchinson’s book “The Hour” which is an account of his attempt to break the record. Its well written, funny autobiographical piece as well as a good historical account of the record itself and the UCI shenanigans. I’ve not read it but people have said good things, the same for Ed Pickering’s book on Obree and Boardman. I’ll second that vote for Hutch’s “The Hour”, very amusing but also much more of a history of the Hour record than a true autobiographical account. One of the most entertaining cycling books in my (pretty extensive) cycling related library. I’ve watched that twice, it’s a brilliant program. Especially seeing the punishing effect of training on Boardman’s body. Agree entirely. Hopefully this rule can follow Hein on the way out. It is not about the bike, one can design a bike and put it into a wind tunnel with no rider to find the best hardware, or the time trial bike with the least coefficient of friction. The spirit of this competition is about the legs, lungs and heart of an athlete for an hour all out. While keeping to a minimum the nonorganic variables such as wheels, frames, and bars. I can see the advantages of this as well but it was never a comparable effort over the years with Merckx enjoying a technological advantage over the others, whether his bike, clothing, going to Mexico or the use of an altitude chamber he created in his basement. With today’s aero, even just clothing and helmet (plus time in the wind tunnel) would make comparison to Boardman pointless. By far the biggest component of a bike is the riders body, most of the mass and the drag of the vehicle. The largest [legal] improvement in performance of the last 20 years has been related to positioning. Going back to a “Merckx” style bike allows for the natural and inevitable improvement in technology whilst at the same time ridden in the position that 99.9% of racing cyclists did and still do use – namely as on a standard road bike. Comparing Merckx with anyone after Lemond is meaningless as there was a massive change in the dynamic of the time trial bike, as great as fairings and thus contrary to the idea of a man on a near standard bike riding as far as they can in one hour. Given that modern helmets cancel some of the improvements of the last 30 years I think the post Tri-Bar record is a much more valuable and valid than the ones set in the “aero” years. Yes in a non perfect world advantages exist. But the job of the UCI in this type of event is as I see it an over site capacity, which is separating out the dependent variables to make a more pure test of endurance. I’m developing a great interest in the Hour record for the coming year. I still think Wiggins weight gain is partly down to building the necessary muscle bulk to withstand an hour of track G-Forces every 7 seconds, not for the physique of a super slender grand tour rider. As everybody else, I hope the UCI comes to it’s senses and stops trying to compare eras in this record, it’s there to be broken, with the latest UCI legal technology. Wiggins is something of a bike romantic too, I imagine the hour holds great appeal. the ironic thing about the hour effort being judged against a merckx era bike is that eddie used the best technology and the lightest bike available to him. The UCI are clinging onto their romanticised notion of a golden age of cycling. Though now if the rules over what a pursuit bike can be so stringent even if the new riders went for best hour performance they would still potentially be aerodynamically behind the boardman and obree bikes. What’s more ironic is the bike Merckx used wouldn’t pass the current rules. Please elaborate Mr Simmons. I would like to know one more reason that the UCI was (hopefully not is) by a bunch of monkeys. With apologies to actual monkeys of course. The only discrepancy cited in discussions elsewhere was that Merckx’ bike probably weighed less than 6.8kg. A miniscule benefit over an hour of riding at near constant speed on a level surface. I’d like to see that 3-rider simulcast but it would be hard to overlay unless they were using tracks of identical size, eg 250m for Manchester (Wiggins) and the new Swiss track at Grenchen which is also (250m). Where would Tony Martin go, the new track in London? Also 3 riders are linked for now but why not have four with Taylor Phinney or more? Well, at least Phinney has an excellent track pedigree. I still think the lack of experience on the track would hinder Martin. I remember when Indurain did his attempt (and broke it on his space age looking Pinarello) that they restricted the crowd as so the level of oxygen in the velodrome remained at a specific level. This was early days of marginal gains I suspect! I think Mig was on more than ‘marginal’ gains! Would be good if Cancellara, Wiggins or Martin gets a new record and we can get rid of Sosenka. Thing is, if they all would ride on the same bike and track Merckx did with the same fuel or lack thereof Merckx’s record might be unbeatable. Wouldn’t the event just become another track event if modern technology was used? As for the argument that Mercxx used the latest tech – yes, that’s true, but does that mean the UCI shouldn’t try to standardize the event from a certain point onwards, so records then can be compared? On the other hand, even with the UCI’s restrictions on equipment, you’d still be able to build a much stiffer, lighter, more aero bike than in Boardman’s day let alone Mercxx’s so even attempts to standardize it would fail. In conclusion, maybe the hour record is fated to be this kind of slightly undefined event. It does seem a flawed concept as there are so many factors and inconsistencies. Despite that, I have to admit to being keen to see how Cancellera (and others?) perform. I suppose it’s because the comparison is superficial, as we can agree it’s not really the same event given advances in bike technology. For me it’s been a test of absolute speed and endurance and I’d like to see it reflect contemporary bike technology. But it’s not “one vision or the other”… We have two different records, with two different sets of rules, that measure different things, and can provide different shows. Both should be valued. By riders and by fans. And both should be attempted by the “3 chrono-tenors”. It’s the fact that the line was drawn after Merckx drilled his bike in such a fashion that a termite would be envious that causes the issue. Why did they arbitrarily decide his changes were ok but others’ weren’t? Seems a lot like wanting him to be built up to be the Babe Ruth, Don Bradman, Michael Jordan, or Michael Schumacher of the sport. it’s so ridiculous to try and create an impossible timelock on this record. Really, unless it’s the same track, bike, kit, air temperature etc etc it’s meaningless anyhow, and who knows what riders have been on what kind of other ‘preparation’ over the years anyway. All it means is that it gets mostly ignored which is a shame. If you want to know who has the best legs and lungs, just sit them on a watt bike for an hour and find out! Come on Cookson, release the shackles!. Merckx’s palmares is so far ahead of anyone in all sorts of ways his legacy looks after itself and doesn’t need protecting. The only rider remotely comparable is potentially Vos if she keeps going. And at least Vos has been able to build her reputation without the help of the UCI to sheppard her legacy . . .
+ 2 Noel, you hit this out of the yard. What I don’t get (unless I’ve misunderstood) is for all the restrictions on type and size of the bike there’s nothing about the material – surely the lightest carbon fibre would make a huge difference? Also on the argument of keeping the bikes the “same” or allowing advances, I think an additional issue is the training required to get used to the “old style” bike and fitting that time on top of current commitments is very difficult. The bike frame (and any other components, for that matter) could certainly be made from any material for weight concerns. 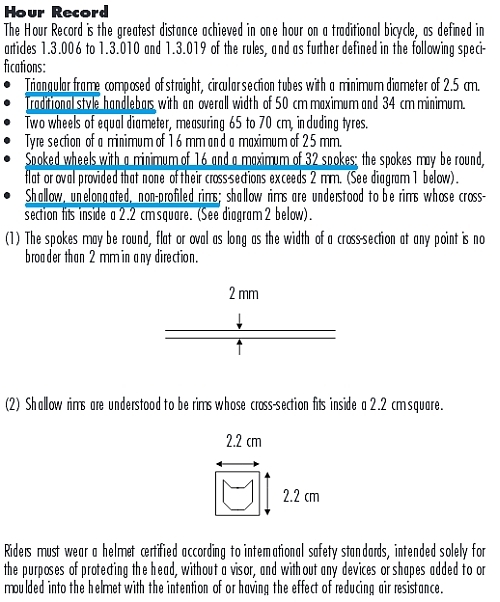 BUT the UCI weight minimum of 6.8kg is still in effect as it applies across the spectrum of road, track, cross, etc. The weight of bikes built for the track isn’t as important as for the road as there are no hills to “drag” the bike up! This is correct and Boardman has said that the major technological ‘innovation’ of Merckx, drilling his bike full of holes to make it lighter, in fact put him at a disadvantage as the drag created by the extra turbulence was far more significant than the weight saving. If the UCI really wants everyone on the same footing as Merckx they should force everyone to drill their bike. Seeing the blogger’s interesting proposal for a synchronised 3-man record attempt, I think it would take a fortune to lure the “3 chrono-tenors” into it. Perhaps Trek, Specialized and Pinarello could agree to finance and get involved on such a bet. But then, the “best human effort” record would be more suitable. I was explaining this 3-rider simulcast to someone today and their reply was “sounds like a virtual road race”. It’s true in some senses, perhaps The Hour should not be about any rider competition but the purity of one rider against the clock? I could see an event every 2 years or so to align with the time trialists and new product release calendars. One race by 1970 bikes to highlight the people and the 2nd race to highlight the technology. Would increase interest in the event. 100% with you on the bike reg’s – should be any UCI legal track bike not just a replica of a bike from yesterday. Someone still have to ride it but technology and cycling go hand in hand its all part of the enjoyment for me. So many opinions on what should be compared and no doubt, regardless of which rule its based on, the press will endlessly compare everything used almost looking like they wish to discredit the record attempt. However – look at motorsport. Outright Lap Record Vs Fastest Lap Record. Outright is including all tech possible, soft tyres that last just one fast lap. Fastest is a lap time set during a race with tech designed for endurance. These compare to the ‘Hour Vs Best hour’ records. The only issue is us/press all arguing over which is comparable to a record set in the 70’s that doesnt fit in either box entirely. Another vote for Hutch’s “The Hour”. 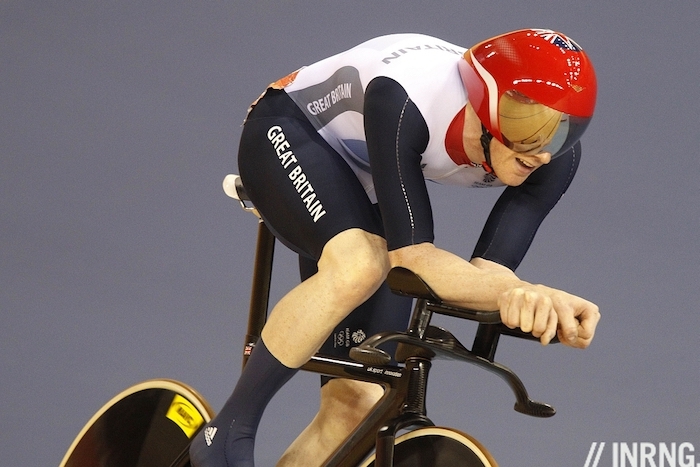 Hasn’t the problem in the past been that the The “Best Hour Performance” record has been considered out of reach, as it isn’t possible to beat Boardman’s 56.375 km 1996 record (set in the superman position) on a bike that is currently track legal (shown in the photo of Wiggins’ on his pursuit bike above)? With Jack Bobridge breaking Boardman’s 4km pursuit world record (Boardman in the superman position, Bobridge on a mdoern track legal pursuit bike) a couple of years ago, then doesn’t this open the door for someone to have a crack at the Best Hour Performance record again? For me, it is perfect the UCI stopped the march of technology in the hour record. 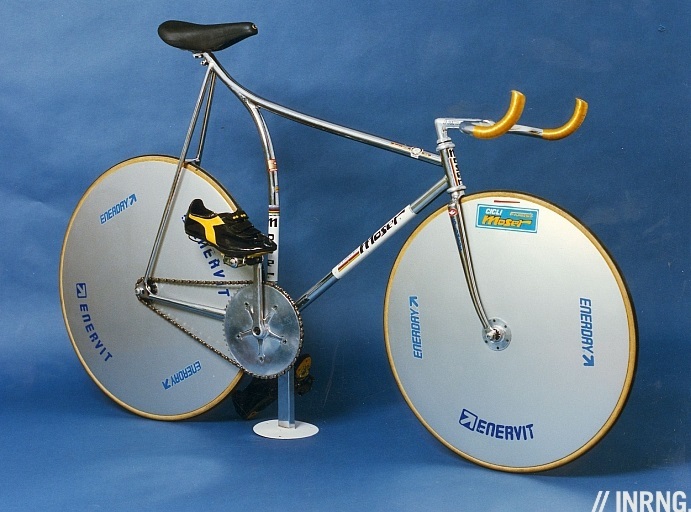 What if one day science makes a bike that lets the likes of you and me ride a hour faster than Eddy did back in1972? What would that mean? Not much to me. Just that we are not better equipped than Eddy was back in the day. Measuring human performance across the ages is something special. I applaud the UCI for taking this step. I know what you mean but it’s never comparable. Merckx rode a better bike than the others before him. And today clothing is better, chains are smoother, bearings are ceramic, training improves and so on. The comparison between eras can be an illusion.